The Villas on Great Bay can make for an excellent place to stay if you are visiting beautiful St. Martin. 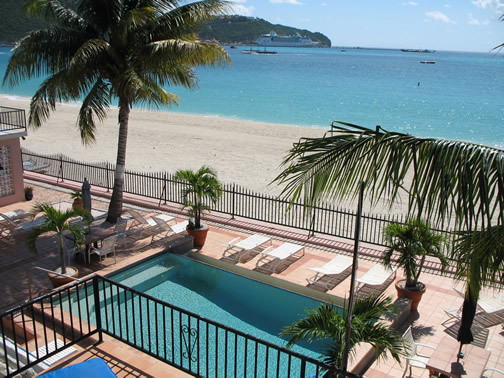 You can find this gated, 12-unit property right on Great Bay Beach in Philipsburg. The surrounding neighborhood is largely residential, and thus tends to be on the quieter side. Within walking distance, however, are duty-free shopping outlets, casinos, bars, and a lively boardwalk. Villas on Great Bay guests can also walk to any number of restaurants, and if they’re not sure to eat, the friendly hotel staff can make both recommendations and reservations. All of the Villas on Great Bay guest units are privately-owned, though they share common characteristics. Each has a full kitchen, a private balcony, two bedrooms, and is well-equipped. Essentially, they are more like apartments than hotel rooms, and therein lies much of the allure. Outside of their units, guests of the Villas on Great Bay can find an infinity pool and extensive patio areas. It’s just steps to the beach should that be the preferred place to relax, and guests who are interested in other things to do in St. Martin can always turn to the onsite managers for help arranging such things as tours and car rentals. A small grocery store can be found just around the corner from the Villas of Great Bay should guests need to stock up on supplies, and there are supermarkets in the general area as well. If cooking just isn’t part of the plan, Villas of Great Bay guests should have little trouble finding a place to eat. St. Martin is home to more than 200 restaurants that can satisfy a range of budgets and preferences.